FromSoftware’s next game Sekiro: Shadows Die Twice is almost upon us and I am incredibly excited for it. Thanks to Activision, I was given the opportunity to preview the game ahead of its March 22 release (this Friday!) and instead of doing your standard preview, I’ve decided to note down some things that might help you when you jump into Hidetaka Miyazaki’s next game. I thought this list would be especially helpful since the game is a departure from various aspects of game design and world design that FromSoftware has become synonymous with. FromSoftware’s Soulsborne formula was one that was scrutinised for its punishing-yet-rewarding nature. It taught players about patience, timing and limitations. Sekiro does something similar but in a much more succinct and punishing manner. Where Dark Souls would allow you to brute force your way through enemies, Sekiro requires you to be a little more composed and concise. Simply bashing everything you see is a very quick way to get yourself killed. One of the bigger changes in terms of combat and pacing that Sekiro has, which helps distance itself from any confusion with the Soulsborne games, is the guard system. Guard is basically stamina in the grand scheme of things, but with some subtlety. Both you and the enemies have a guard meter and when that meter hits its max your guard is broken, leaving either you or the opponent open for a riposte style counter-attack. Simply trying to bash your way through your opponent’s guard will not work. Sekiro’s enemies are designed to strike back, meaning that if you don’t keep composed they will make sure you know where you messed up and they will not hesitate to make the price of your mistake a quick death. So if you can’t just bash everything, what can you do? Well, Sekiro offers a variety of ways to break your opponent’s guard outside of the basic dodging and timing your hits. You can block, which adds to their guard meter the same way hitting them in their block adds to your guard meter, you can deflect by blocking right before they hit you (majorly adding to their guard meter and leaving them open to a hit or two, if not a hard-hitting counter-attack) or you can also capitalise on the game’s more advanced movement system (compared to Soulsborne games) to avoid attacks and create openings. One of the biggest departures from the gameplay that Miyazaki and his team are known for is the emphasis on verticality. Where the Soulsborne games do their best to keep you grounded, Sekiro encourages you to use the Shinobi Prosthetic (the robot arm) as a means of traversal. 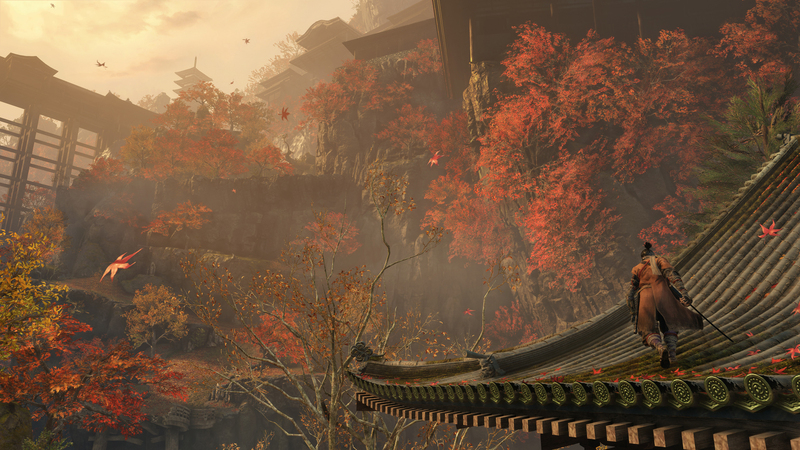 Grappling onto different tethering points and scaling up walls all are an integral part of the Sekiro experience. In some aspects you could make a comparison to the recent Tomb Raider games, which feature a lot of the same themes in terms of general gameplay, while also adding the masochistic FromSoftware twist to it. 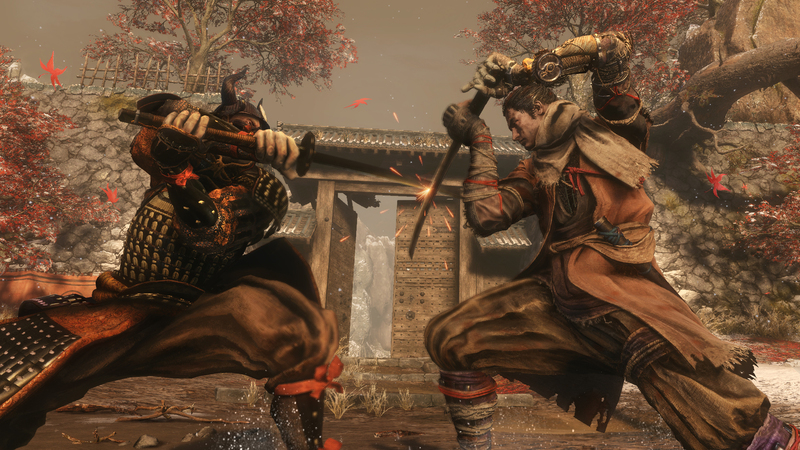 The movement changes create a different pace to the game, as the designers at FromSoftware have had to completely rethink how they approach the level design for Sekiro, as well as the combat mechanics. Should you choose, you can use the verticality of the game to try and gain an advantage on the enemies, doing different aerial executions and attacks or just using your heightened movement as a means of retreating and recuperating. While what I played only really gave me a glimpse of what the game has to offer in terms of movement mechanics, I would not be surprised if there is a tool that you can get for the Shinobi Prosthetic that adds to these as you progress. Something which Sekiro has – which is a bit of a new thing for Miyazaki – is a proper stealth mechanic. You can hide in bushes to sneak around enemies or even get stealth kills. In some situations, the smarter thing is to avoid any engagement and make your way past. Obviously, you can just go in with your sword swinging, trying to kill everything in your path, but the game’s design is such that it encourages you not to engage in combat with everything you see. Take the time to survey your surroundings, plot the best course of action, sneak past your enemies or pick them off quietly, one by one. It’s this level of detail and thought that goes into creating the worlds and levels that make FromSoftware’s games so great, and Sekiro is no exception. Explore, enjoy the world. You don’t need to race to the finish. One thing you will notice almost immediately is how the game focuses a lot more on the direct narrative, rather than having the world tell you each individual story. FromSoftware games were previously known for being cryptic and uninformative unless you investigated the story yourself through item descriptions and dialogue. The stories were also one that was not a set in stone thing and was very open for interpretation. So in a way, the story of the Soulsborne games can be unique to each person. As a departure from this, the team at FromSoftware has created a character for you to assume the role of in the form of the One-Armed Wolf, and they give solid context for his actions. They provide detail into why he is the way he is and what his motivations are. You will also need to focus a bit more on what’s happening as all the dialogue is in Japanese, at least from what I’ve played. Naturally, there are subtitles for those who are not fluent in the language. The characters felt a bit more prominent and interesting, but how that translates into the further regions of the game remains to be seen. Hopefully, with all of these things your transition into the hauntingly beautiful world of Sekiro: Shadows Die Twice is as pleasant and smooth as possible. The game will be challenging and will happily punish you for making mistakes, but like any FromSoftware game, it will be worth the patience and perseverance to push through and make it to the end. Bring on March 22!